[Update: January 10, 2018] We received a response to our petition from the Lord Mayor’s office. 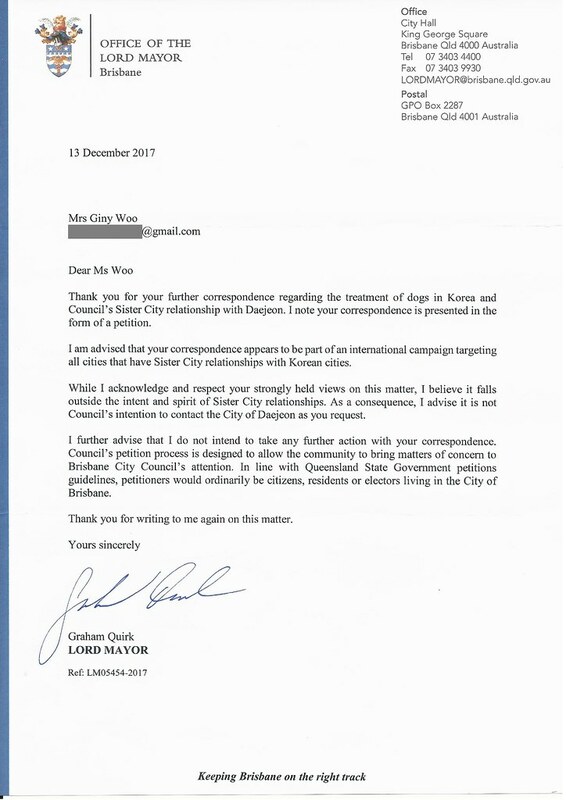 We have filed the petition to the Council Offices in the City of Brisbane, in line with the instructions from the Mayor’s Office (click HERE for our campaign page), and we received the response below from the Mayor’s Office, dated December 13, 2017. We are very disappointed with the Mayor’s response and unwillingness to engage in any way with their Sister City on this matter. However, we hope that the Mayor and the Council Members of the City of Brisbane will have a change of heart, and to help end South Korea’s horrific cruelty through killing and eating our best friends. A big thank you goes out to all the supporters who have taken action on this and especially to Don D. and Heather H. for joining me on this particular petition and campaign, which we are now closing. 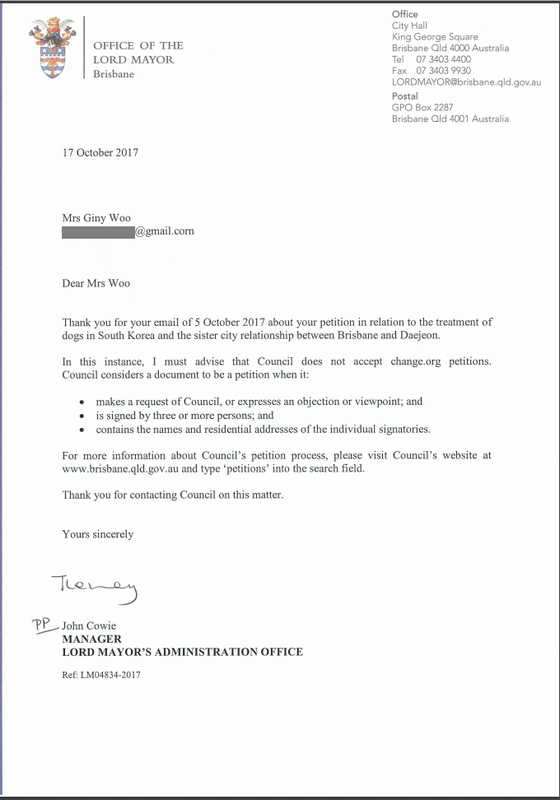 [Update: October 17, 2017] We received another response from the Lord Mayor’s office. To comply with Brisbane’s petition requirement, please send your petition letter signed by 3 or more persons with their residential addresses. You can use our petition text or your own words for the petition letter. Click HERE for our petition. Click HERE for Brisbane’s petition requirements. 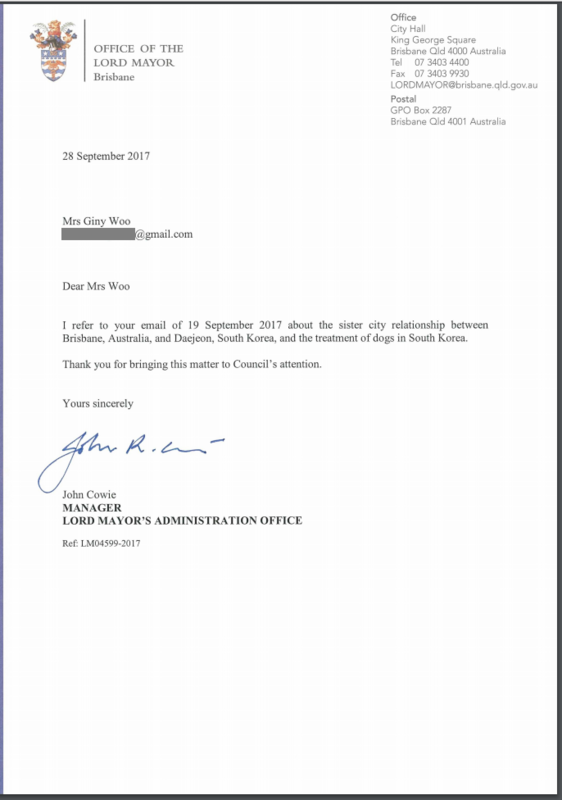 [Update: September 29, 2017] We received the below confirmation letter from the Brisbane Mayor’s office. 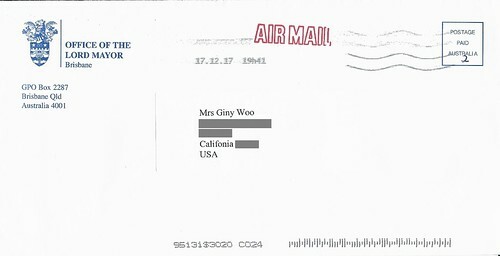 We appreciate the Mayor’s office for responding to our petition and we hope to receive a positive message soon. I’m praying humans will get a heart and soul and will STOP TORTURING AND EATING DOGS! SHUT DOWN DOG MEAT FARMS!!! Do they think their constituents have different views than us and think it’s ok to boil a live dog? Will they dare to ask the citizens? No, they won’t. People must know what ignorant subhumans they’vw elected. Well, what a load of mindless, subhumans you are! You will fit in well in south korea, they also are backward, self serving and devoid of any sort of humanity or compassion. Disgraceful examples of humanity.